This article is about the performing art. For other uses, see Mentalism (disambiguation). "Mentalist" redirects here. For the TV series, see The Mentalist. For other uses, see Mentalist (disambiguation). 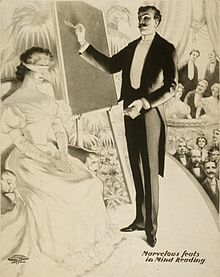 Mentalism is a performing art in which its practitioners, known as mentalists, appear to demonstrate highly developed mental or intuitive abilities. Performances may appear to include hypnosis, telepathy, clairvoyance, divination, precognition, psychokinesis, mediumship, mind control, memory feats, deduction, and rapid mathematics. Mentalists are sometimes categorized as psychic entertainers, although that category also contains non-mentalist performers such as psychic readers and bizzarists. Much of what modern mentalists perform in their acts can be traced back directly to "tests" of supernatural power that were carried out by mediums, spiritualists, and psychics in the 19th century. However, the history of mentalism goes back even further. Accounts of seers and oracles can be found in works by the ancient Greeks[attribution needed] and in the Old Testament of the Bible. Among magicians, the mentalism performance generally cited as one of the earliest on record was by diplomat and pioneering sleight-of-hand magician Girolamo Scotto in 1572. The performance of mentalism may utilize these principles along with sleights, feints, misdirection, and other skills of street or stage magic. Styles of presentation can vary greatly. Traditional performers such as Dunninger and Annemann attributed their results to supernatural or psychic skills[contradictory]. Some contemporary performers, such as Derren Brown, attribute their results to natural skills, such as the ability to read body language or to manipulate the subject subliminally through psychological suggestion. Others, including Chan Canasta and David Berglas would make no specific claims but leave it up to the audience to decide. Contemporary mentalists often take their shows onto the streets and perform tricks to a live, unsuspecting audience. They do this by approaching random members of the public and ask to demonstrate their supernatural powers. Performers such as Derren Brown who often adopt this method of performance tell their audience before the trick starts that everything they see is an illusion and that they are not really "having their mind read." This has been the cause of a lot of controversy in the sphere of magic as some mentalists want their audience to believe that this type of magic is "real" while others think that it is morally wrong to lie to a spectator. Mentalists generally do not mix "standard" magic tricks with their mental feats. Doing so associates mentalism too closely with the theatrical trickery employed by stage magicians. Many mentalists claim not to be magicians at all, arguing that it is a different art form altogether. The argument is that mentalism invokes belief and when presented properly, is offered as being "real"—be it a claim of psychic ability, or proof that supports other claims such as a photographic memory, being a "human calculator", the power of suggestion, NLP, or other skills. Mentalism plays on the senses and a spectator's perception of tricks. Magicians ask the audience to suspend their disbelief and allow their imagination to play with the various tricks they present. They admit that they are tricksters and entertainers, and know the audience understands it's an illusion and the magician cannot really achieve the impossible feats shown, such as sawing a person in half and putting them back together without injury. However, many magicians mix mentally-themed performance with magic illusions. For example, a mind-reading stunt might also involve the magical transposition of two different objects. Such hybrid feats of magic are often called mental magic by performers. Magicians who routinely mix magic with mental magic include David Copperfield, David Blaine, The Amazing Kreskin, and Dynamo.. Notable mentalists who mix magic with mentalism include The Amazing Kreskin, Richard Osterlind, David Berglas, Derren Brown, and Joseph Dunninger. The Amazing Kreskin has audience members hide his cheques before the show; if Kreskin cannot find the cheque at the end of his performance, he does not get paid. Eric Dittelman, a mind reader, performed on Season 7 of the NBC talent competition America's Got Talent. He made it to the semifinals, and was the first mentalist to be featured on the show. Cristian Gog, a mentalist, won the big prize on Romania's Got Talent. The Mentalist: an American crime procedural television series in which the main character, Patrick Jane, worked as an independent consultant for the California Bureau of Investigation and later the Federal Bureau of Investigation, solving serious crimes by using his skills of observation and his frequent use of his abilities as a former professional mentalist. Psych: an American criminal comedy television series in which the main character, Shawn Spencer, works as a consultant to the Santa Barbara Police Department as a "psychic detective". Though he purports to be a psychic, the truth is that his exceptional observational skills, amazing vision, and near-photographic memory allow him to portray himself as such. Now You See Me: Merritt McKinney, played by Woody Harrelson, performs as a mentalist. Pretham: John Don Bosco, played by Jayasurya, performs as a mentalist in the Malayalam movie released in August 2016. Wikimedia Commons has media related to Mentalists. ^ Cassidy, Bob: "Fundamentals of Professional Mentalism". Lybrary, 2007. pp. 7-9. ^ Randi, James (1995). "An Encyclopedia of Claims, Frauds, and Hoaxes of the Occult and Supernatural". St. Martin's Press. Retrieved 2008-03-28. ^ Hamilton-Parker, Craig (December 1, 1996). "Medium with a message". Scotland on Sunday. p. 5. ^ "Jayasurya to play a mentalist in Ranjith Sankar's 'Pretham'". 2016-06-20. Retrieved 2016-08-13. William V. Rauscher. (2002). Mind Readers: Masters of Deception. Mystic Light Press.